Why Don't Ted Cruz's Clothes Fit Him? Ted Cruz is running for President of the United States, which unfortunately means we're all going to be seeing a lot more him and his abomination of a wardrobe. Male politicians have it particularly easy when it comes to daily outfit selection. All they have to do is buy some boring suits that fit, buy some shirts that fit, buy some conservative ties and call it a damn day. We don't ask for much, which is why I expect them to be able to handle it. Presidential candidate Ted Cruz, however, does not seem up to the challenge of wearing clothing that flatter his body in any imaginable way. Now, I'm not a tailor, but I have eyes. Are suits supposed to make one look like a giant rectangle? Should your trench coat double as a Snuggie? Are shirts that are one size too big the best option? Let's remember that Ted Cruz can't even secure his own eponymous URL. What I'm saying is, this is a man who wants to run the entire country and he can't even manage his personal wardrobe properly. Think about it. 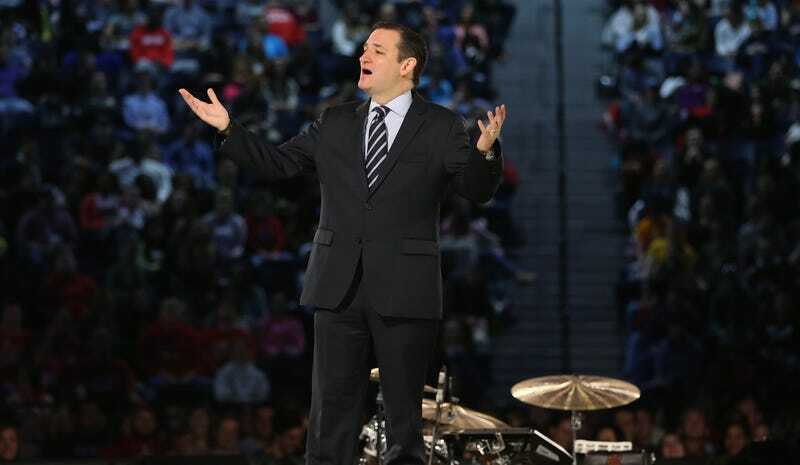 Pay special attention to the shirt collars, because in Ted Cruz's America, starch is for losers. Denim should not be this difficult to look at it. I sympathize with this shirt collar because it seems to have become sentient and tried to free itself from the nightmare of hugging Ted Cruz's neck. A VISIBLE UNDERSHIRT, PEOPLE. Do you really want a president who's never heard of v-necks? Obviously when you sit down your pants are going to ride up a bit, but this is absurd. The man is wearing formal clamdiggers and cowboy boots. "Do you make suits that feel like cocoons?" It's cool when the sleeves of your jacket can also be emergency water wings. That ostrich didn't die to be disrespected like this. "Just ring up the largest jacket you have!" It's a shame too, because his family looks lovely and well-dressed. This photo was taken in 2013, not 1983.